The EU-Canada Summit on 26 September in Ottawa aimed to seal the deal on a controversial EU-Canada free trade agreement - in the dying days of the current EU Presidency. But in the last few days we’ve been offered a rare public glimpse into a remarkable and fierce power struggle between the EU Commission and some member states over this agreement, which would have dramatic consequences for public services including health, and for democracy. When the secret negotiations over an EU-Canada free trade agreement (CETA) started in 2009 with a secret negotiation mandate agreed by the EU Council and the Commission, few noticed or cared. But the deal has become hotly contested in the wake of the controversies over TTIP, the EU’s free trade deal with the US, whose secret negotiations are at an earlier stage. At the centre of the controversy is the proposed introduction of a so-called “investor-state dispute settlement” procedure. ISDS allows foreign investors to sue governments in private “arbitration courts” over any regulatory activity that the investor deems “unfair” or that could impair their “legitimate profit expectations”. If CETA does contain the ISDS, then any US corporation with substantial business activity in Canada can use CETA for suing European governments in private investment arbitration courts, even without TTIP, or without ISDS in TTIP. Across Europe there has been mounting outrage against the idea that public courts aren’t good enough for corporations, and that they should they enjoy a parallel, secret and hugely powerful legal system of their very own. 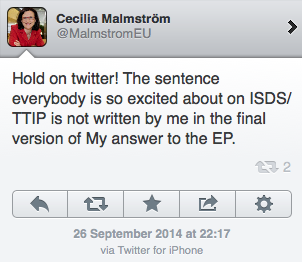 The Commission was alarmed enough to launch a “public consultation” about ISDS in TTIP back in March. They received 150,000 responses - overwhelmingly against ISDS. But they won’t evaluate the consultation until November. They insist it applies only to TTIP, not CETA. Meanwhile, outgoing EU Trade Commissioner Karel de Gucht claims he has a negotiation mandate from the Council with ISDS and therefore ISDS will be in CETA. De Gucht’s determination to push CETA through, with ISDS, is shared by his boss, outgoing Commission President Barroso. In August de Gucht presented the result of the last CETA negotiation round, a “final” and still secret CETA text of more than 1500 pages, to the EU Council’s trade committee. Quite a number of governments raised strong concerns about various elements, particularly ISDS, and some threatened not to sign if those elements were not removed. No problem for Karel de Gucht. The Commission argues that the CETA negotiations are now closed and any attempt to reopen them would kill the treaty. Trade negotiations are kept more secret than disarmament negotiations. The public and the parliaments have no access to the negotiation papers. They have no role in formulating the negotiation mandates. They are reduced to powerless bystanders. The only reliable information the public gets are documents leaked by bureaucrats who are fed up with what happens behind closed doors. Parliaments must in the end ratify the agreement, of course, but they almost always say yes. And it is still not even clear which Parliament must ratify the agreement. The Commission says only the EU Parliament (and Canadian government) must ratify CETA, while the member state governments say their 28 national parliaments have to vote on it, too. In the run-up to last week’s EU-Canada summit, the power struggle over CETA was heading for a showdown. Berlin. The German Bundestag discusses CETA motions tabled by the opposition Left Party and Green Party. Sigmar Gabriel, Vice Chancellor and Minister of Economics, maintains that for his Social Democratic Party and for the Government, ISDS is not necessary, and demands further negotiations to take ISDS out of CETA. The opposition calls for a more powerful stance, worried that Karel de Gucht and Barroso would announce the following the day “that negotiations are concluded” and the treaty “could not be changed anymore”. Gabriel tells parliament it should not look to commissioners that are on their way out but to the incoming new Commission. Essentially he says, what will take place tomorrow in Ottawa is a meaningless and empty charade. Ottawa. De Gucht, Barroso and EU Council President Van Rompuy proceed as expected, in a ceremony with Canadian PM Harper they announce that the treaty is concluded. But Canada’s media highlight the persisting doubts whether the lame duck EU representatives really represent the political reality in the EU. Harper’s and Barroso’s party was spoiled. “Harper, EU leaders celebrate trade deal they haven't sealed”, wrote CBC. Brussels. The Commission finally puts the 1634-page CETA treaty text on their website. Numerous leaks had been published before, by NGO websites and even the main German public TV channel. But officially, the public – and that includes members of parliaments in Brussels, London, Berlin and elsewhere - gets the text on the very day that “negotiations are concluded” and “the text cannot be changed anymore”. Canada’s public and MPs get nothing from their government, but of course they can access the EU website. An EU Commission U-turn on ISDS? European parliament staffers are amazed. The Socialist & Democrat group are delighted, celebrating in a press release: "This is extremely welcome news and a major victory for the S&D Group which has led Europe-wide calls for this mechanism to be scrapped." “Hold on twitter! The sentence everybody is so excited about on ISDS/TTIP is not written by me in the final version of My answer to the EP.” . Berlin daily newspaper Der Tagesspiegel wants clarification from Juncker himself. Juncker’s speaker tells the paper: no, Malmström’s change of mind on Twitter is not the new Commission’s opinion. The new Commission does want ISDS out. At 16:01 they publish an article on their website: Juncker will drop ISDS from TTIP, this is the policy of the incoming Commission. So is she for or against ISDS? There will be big questions for Malmström when she presents herself for oral questions in the European Parliament today. You would expect Cameron’s Conservative Euroskeptics to loudly protest that “Brussels” is usurping power, making a mockery of British sovereignty, and that an unelected unaccountable bureaucracy is taking decisions that belong into democratically elected parliaments. But no, there is nothing. They stay silent. They support CETA and TTIP and support de Gucht’s and Barroso’s machinations. In reality, the Machiavellian machinations of the trade commissioner and the dealings in the EU Council behind closed doors serve their interests very well. Handing more and more power to corporations at the expense of democratic policymaking is a policy that is not likely to be popular, even among Conservative constituencies. The possible crash of the current CETA and TTIP treaties highlights two things. First that so-called “trade deals” are about many more things than just “trade” - they are about the future of our public services, our right to regulate and protect our citizens from corporations. But also the democratic deficit in how such deals are currently handled. It seems the important and far-reaching decision whether we introduce a parallel legal system for corporations involves parliamentarians only as minor players. It is bureaucrats and executives pulling the strings and taking the key decisions. For a democratic and legitimate trade policy, any mandate given to the Commission must be publicly debated in all member states, and agreed in open parliamentary debates. Nothing should be negotiated that the peoples of Europe do not want. All negotiation papers must be open and accessible. And if the Commission and the US Trade Representative say we cannot negotiate such treaties publicly, then there will be no negotiations. So far, the trade treaty process has generally resembled a hidden power struggle in a medieval royal court, more than a transparent, accountable decision-making process in a modern democracy. The role of parliaments in this whole farce is akin to the Supreme Soviet: a rubber-stamping body whose role in such trade agreements is to say dutifully “yes” at the end of the procedure. Secret dealings like the ones we witness now have no place in a modern democracy.